JAKARTA, Indonesia — The Himalayan Kingdom of Bhutan has never won a medal of any kind at the Asian Games, much less the Olympics. The country's fame, instead, comes from its billing as one of the happiest places on earth. In fact, the government promotes a concept it terms "Gross National Happiness" as a way to measure success. "People at home are not unhappy we have not won," Younten Tshedup, a reporter for the national newspaper Kuensel, told the Associated Press at the Asian Games. "Everyone is happy, even with no medals. But medals this time would be icing on the cake." By comparison, Bhutan's giant neighbor China has won more than 3,000 medals — about 1,500 gold — in Asian Games competitions. "We are hoping to change it this time," Younten added. Bhutan, with a population of only 750,000, has 24 athletes entered in sports including archery, taekwondo, boxing and — believe it or not — golf. Karma Karma, who competed two years ago at the Olympics in Rio de Janeiro, could break through in archery, which is Bhutan's national sport. She was also the flagbearer in Saturday's opening ceremony in Jakarta. Soccer and cricket are also popular in Bhutan, but competition is amateur. Archery has many participants, but the disciplines practiced at home are different than those on the Asian Games and Olympic sports programs. "We'd be happy with any medal," Nim Dorji, the head of the delegation, told The AP. Several athletes in taekwondo could break through. They talked up their chances — but were realistic, too — on Monday while seated around a table eating lunch and decked out in their distinctive orange and yellow uniforms with the dragon crest on the chest. "Bhutan is a very small country," taekwondo athlete Tenzin Dorji explained. "We don't have the facilities. Maybe that's why we are not winning. In Bhutan we (athletes) are all students and we only practice for four hours. In other countries they are almost practicing for a whole day." Part of the challenge has been Bhutan's isolation, trapped between China and India in the Himalayas. It has just recently begun to open up with television and social media pushing quick change, and the natural beauty also is a lure that attracts outsiders. Nim, the head of the delegation, said the Bhutan government was getting more involved and offering incentives. "We are a small country known for our culture and traditions," taekwondo athlete Kinzang Choden said. "But sports are not our careers. Education is given more importance than sports by the government." 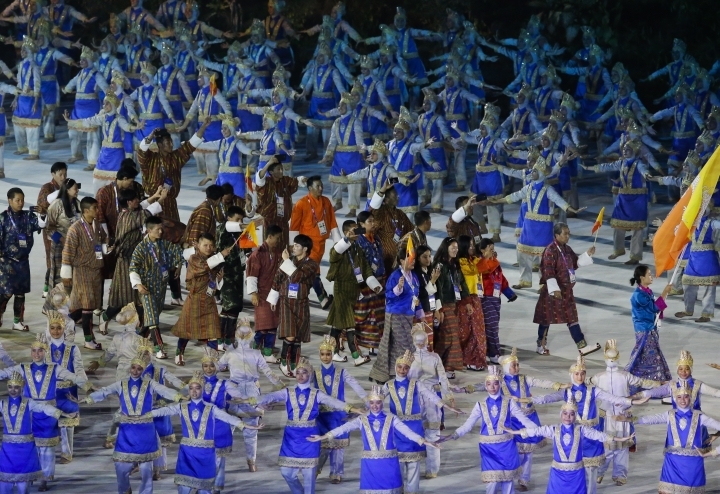 Bhutan has sent athletes to every Asian Games since 1990, according the country's profile on the Asian Games website. The closest it has come to winning a medal was in 1998 in Bangkok, when its men's archery team lost a bronze-medal match against China. Bhutan is not alone in Asia in its medal struggles. East Timor, Indonesia's neighbor on the eastern border, is also yet to win a medal at the Asian Games, a quadrennial event that has attracted more than 11,000 athletes from 45 countries and territories competing in 40 sports. The website for the Olympic Council of Asia — the governing body of regional sports — shows six other nations that have won medals, but never a gold medal: Afghanistan, Brunei, Laos, Nepal, Palestine, and Yemen. "Everyone here is expecting a medal," Younten, the Bhutanese reporter said. "We are expecting a few, but we're not very sure about which disciplines."